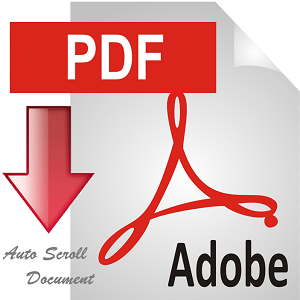 How to auto scroll a document in adobe reader continually – Move PDF document in adobe reader, up or down side, at any speed you want. You know adobe reader only open a document of PDF format. We can read any article, book, slide and any other document which is in PDF format. 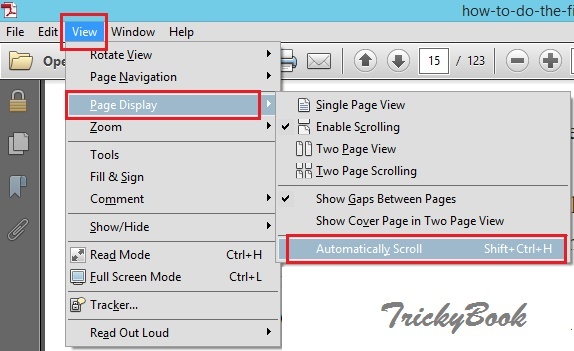 You scroll a document in adobe reader by pressing down/up arrow keys. You need to press these buttons rapidly for up and down the document. This thinking is boring when you read a long document or book. In adobe reader, you can scroll automatically up and down document, with any speed you want. This facility is very helpful for the readers that prefer to read documents on computer screen. You may also like to read How to convert webpage to pdf format. Open any PDF document or book in Adobe Reader. For scrolling document, go to top menu bar, Click on view and then in Page Display select automatically Scroll. Or simply using short key for scrolling Ctrl­ + Shift + H. Your document is start moving. This start moving with default speed. You can increase/decrease moving speed by press up arrow keys. You can set the speed according to your reading speed. When you start auto scroll in adobe reader than you cannot go to next page by using arrow keys. Because now arrow keys are used for changing the speed of the document. So, for moving next page press Space Button or pg down keys. If you want to stop auto scroll than again press Ctrl +shift +H Buttons. After press these short keys, your document is stop continue scrolling. Hope! You enjoy auto scroll a document in adobe reader. We often said that reading in soft form on computer screen is a difficult job. Therefore, we prefer to read textbook in hard form. But this type of facilities like current auto scroll facility increase the interest of readers 😀 .